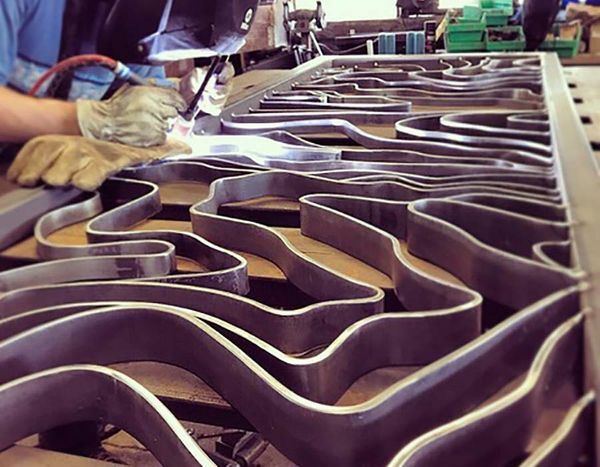 At our studio tour, guests will have the opportunity to observe the distinctive sights and sounds of metalworking during a live demonstration of our fabrication process. MetalWork Austin will showcase a steel gate designed by Ryan Scott-Nairns and fabricated by our team of skilled metalworkers. We’ll be giving away two gift baskets by way of a drawing at each half of the tour. We work with architects, builders, designers, and home owners, bringing their visions to life through our client focused process. MetalWork Austin offers customized metalwork projects that require the knowledge and skill of welding steel, stainless steel, aluminum, brass, bronze, copper, and Corten steel. Special finishes are often an important aspect of accomplishing the right look for a project. We extend a variety of finishing options such as blackened or rusted patinas, antiqued finishes, bronze finishes, clear coats, and most common metal finishes that include paints and powder coats. We specialize in architectural details, railings, furniture, and metal art. Although we take on projects of all types, if it’s made of metal we can most likely build it! Ryan has a strong background in ornamental ironwork, blacksmithing, modern fabrication techniques & design, and has been successfully creating and collaborating with clientele since 2008.